Groff is a talented writer with a novel, the widely praised “The Monsters of Templeton,” and a book of short stories, “Delicate Edible Birds,” to her credit. From start to finish, “Arcadia” is poetically delivered through Bit’s eyes. Bit is Ridley Sorrel Stone, an endearing, diminutive character nicknamed from the phrase “Our Littlest Bit of a Hippie.” Groff begins in 1968 with a two-page prologue of Bit’s earliest memories from the womb. This mystical recounting of Bit’s prenatal recollections becomes a legend among the hippies. Click the image below to read my review in the St. Louis Post-Dispatch. 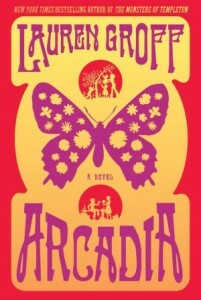 You can buy Arcadia at Barnes and Noble. In The Los Angeles Review of Books, I talk with writers, Robert Bausch, Polly Frost, Nina Vida, Molly MacRae; newspaper book editors Laurie Hertzel, Ron Charles, Greg Cowles, and freelance book critics, reviewers, and more about the state of indie-publishing. I look forward to reading your comments here on my blog or on the LARB site. Click the image below to read more in the March 17, 2012 edition ofThe Los Angeles Review of Books. Megan Mayhew Bergman is a top-notch emerging writer. 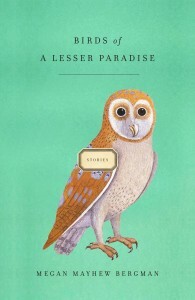 In this first book, “Birds of a Lesser Paradise,’’ a collection of a dozen stories, she portrays in fine realistic prose female characters balancing relationships with their fathers, mothers, and partners, as they fight their own foibles and insecurities. Her characters are strong, sensible, but vulnerable. Bergman’s stories take place mostly in the South – on a prison farm, in the Carolina swamp, and on the road. (A North Carolina native, Bergman lives now in Vermont.) But no matter the locale or the humans involved, there’s always an animal of some sort – a dog, a bird, a cow, a wolf – that influences her characters’ lives. Click the image below to read my review in the March 7, 2012, edition of the Boston Globe. You can buy Birds of a Lesser Paradise at Barnes & Noble.